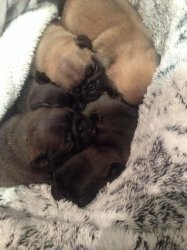 2 beautiful KC reg pug puppies available for sale from a litter of 5 all white gene carriers. All puppies are self-whelped. The puppies have been raised in a very loving environment and cared for extremely well by mother. 1 fawn girl 1 silver girl both parents are from an excellent blood line with many recognizable names including Little Monsters Eastonite and Marbleton. Mother is apricot fawn and can be seen father is 'Fred' a beautiful silver dog .Puppies are ready to leave. The puppies will leave with Kennel Club registration papers; 5weeks free pet insurance, First vaccination, and a puppy pack including a teddy with mothers scent. Feel free to contact for more information.